A weld nut, also known as a Slab Base Spot Weld T-Nut. These fasteners are commonly used in channel areas, where the rectangular flange can easily fit without overhanging the edge of the base material. The flange, even though slim, can give added strength to the base material, providing a double layer of support when welded to the base. This means that the torque applied to the threaded portion is spread over a larger area (the flange), and some of the torque is also absorbed by the flange, resulting in less distortion of the base material. This helps to eliminate twisting and separation of the threaded fastener from the base material as torque is applied through normal applications. These stamped, flanged weld nuts are plain (flat), rectangular T-nuts. The slab base is flat on both sides, which allows for a variety of applications. These fasteners can be used in both flush-mount and through-the-hole applications, because there are no projections to interfere with mating of the base material and the fastener flange. JHP Fasteners’ slab base spot weld T-nuts feature generous barrel lengths to provide secure thread engagement. When combined with the optimum flange size, like the selection we offer in our catalog, the stamped weld nuts provide secure fastening capabilities for assemblies. 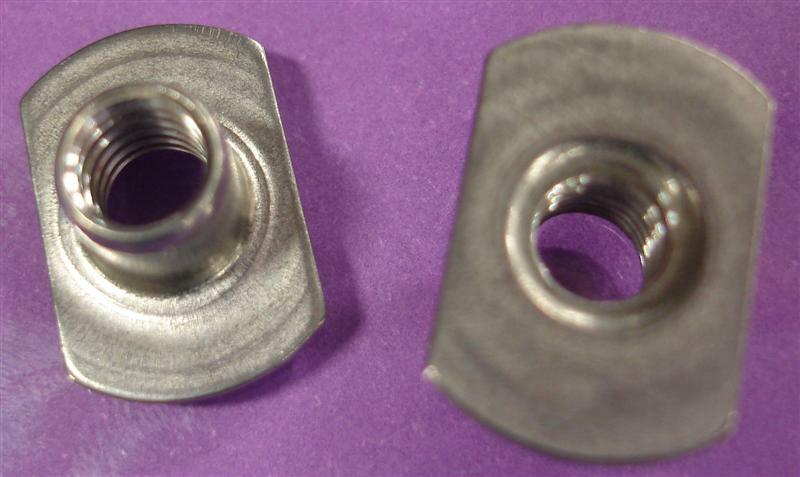 Because of the slim flange size, these fasteners can be easily spot welded. In addition to that, the slab base eliminates the need for orientation during welding. Some T-nut fasteners for non-metallic applications may be fed and applied using automated machinery designed specifically for such applications. JHP Fastener’s stamped, flanged weld nuts (T-nuts) are made of low carbon steel, or you may also choose them in austenitic stainless steel. They come in a variety of thread sizes and offer a great alternative to costly tapping operations.